PASSION: Art, Fashion, Surfing, Fishing and Hula. Sig Zane is the official cultural ambassador of Waiola. With his work as an artist and expertise in Hawaiian culture and history, he is the spiritual guide for our coconut water. Sig is equally a purveyor and practitioner of Hawaiian culture as an avid surfer, fishermen, hula dancer, artist and intellectual. 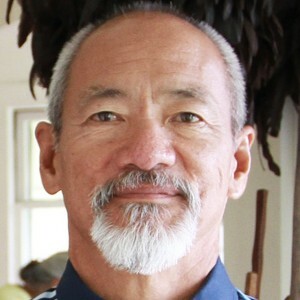 His artwork can be readily seen through Sig Zane Designs: his Alohawear and design company based in Hilo, Hawaii. In addition to providing the wardrobe for the on-air media personalities of the Merrie Monarch Festival, Sig Zane Designs also provided the art direction for the Sheraton Kona Resort renovation and designed the exterior of Hawaiian Airlines’ new fleet of modern, ATR42 turboprop aircrafts. With Sig’s guidance, Waiola is prepared for this journey to hydrate the world with Naturally Untouched coconut water while honoring our ancestors in the process.